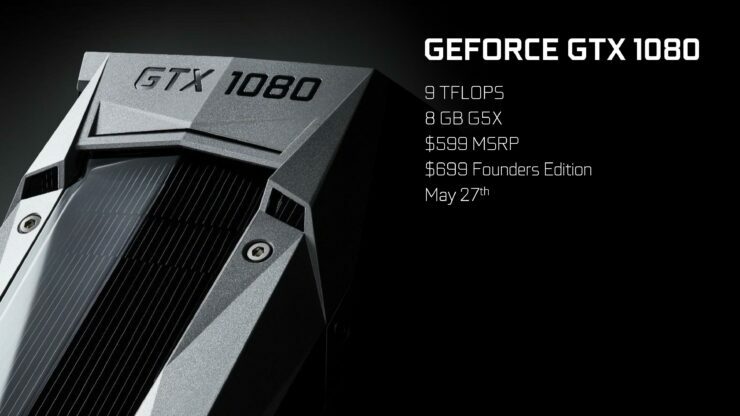 NVIDIA has announced their next-generation GeForce GTX 1080 graphics cards for $599 US. The GTX 1080 is based on the FinFET architecture that provides huge increase in transistor density and massive performance per watt improvements. The GeForce Pascal products will deliver the most competitive graphics performance to gamers around the globe in the latest AAA blockbuster titles. The NVIDIA GeForce GTX 1080 is NVIDIA’s New Performance Champ! 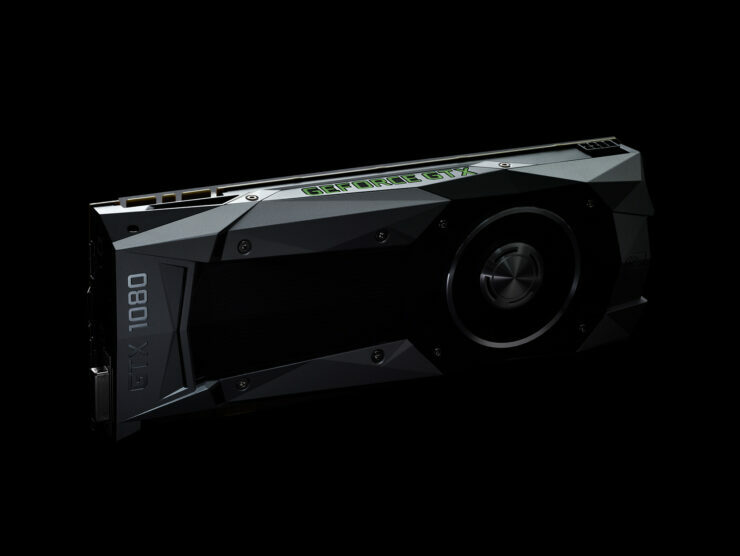 The NVIDIA GeForce GTX 1080 is the next chapter in high-performance gaming graphics cards. Featuring the latest Pascal architecture designed by NVIDIA, the GeForce GTX 1080 will allow gamers to play 4K and VR content at improved FPS compared to current generation graphics cards. The GeForce GTX 1080 takes the GeForce platform to the next level with a range of new features aside from performance which we will be detailed completely. Let’s take a trip down the journey to Pascal. In 2014, NVIDIA announced their Pascal GPUs which were part of their latest roadmap. The Pascal GPUs would become NVIDIA’s first GPUs to feature high-bandwidth memory and will be aimed at HPC and Gaming machines. 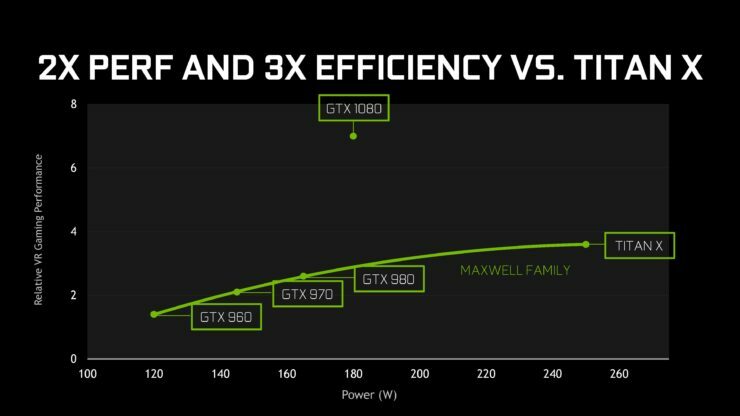 After the launch of Maxwell, NVIDIA gained a lot of experience in the efficiency department which they put a focus on since their Kepler GPUs. The experience and the launch of smaller process technology allowed NVIDIA to develop their fastest Pascal GP100 graphics chip. Aimed at the HPC accelerators first, the GPU would not see a launch on the gaming front till 2017 but NVIDIA had several SKU designs ready with Pascal architecture. One specific SKU is the GP104 GPU which is announced today and featured first on the GeForce GTX 1080 graphics card. The GP104 Pascal GPU Features 2x the performance per watt of Maxwell. The GP104 GPU is the successor to NVIDIA’s GM204 GPU and sticks to the same principles which made the GTX 980 and GTX 970 great which is to offer gamers the best performance at the highest efficiency rate (perf / watt) and deliver products that are highly competitive in pricing and performance. The NVIDIA GeForce Pascal graphics cards are built to offer the best gaming performance and capabilities. 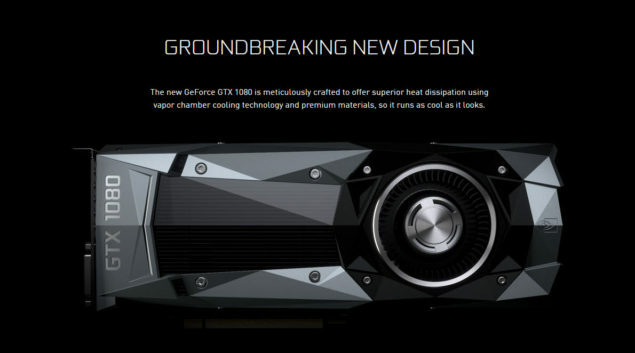 To do so, NVIDIA is deploying a range of new tools and SDKs to make Pascal their best ever Gaming platform for PC. NVIDIA announced several gaming initiatives for the Pascal GPUs with key technologies revolving around their GameWorks and VRWorks programs. Next-Gen GPU Architecture. 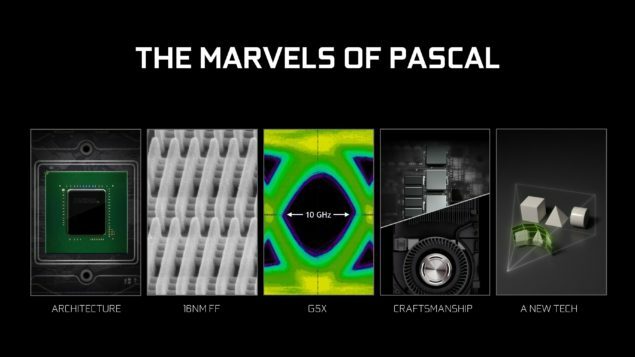 Pascal is optimized for performance per watt. 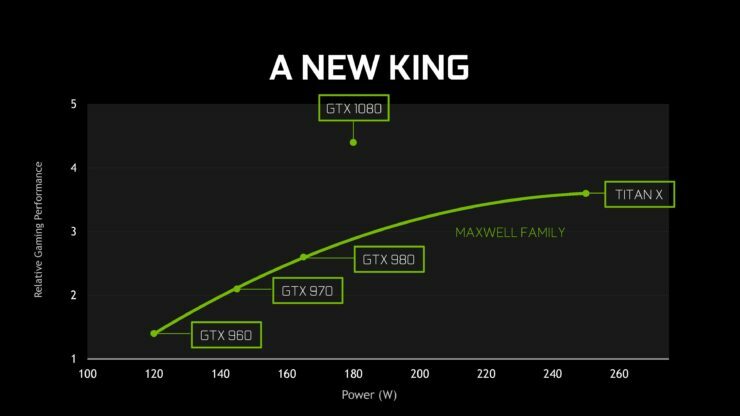 The GTX 1080 is 3x more power efficient than the Maxwell Architecture. 16nm FinFET Process. The GTX 1080 is the first gaming GPUs designed for the 16nm FinFET process, which uses smaller, faster transistors that can be packed together more densely. Its 7.2 billion transistors deliver a dramatic increase in performance and efficiency. Advanced Memory. Pascal-based GPUs are the first to harness the power of 8GB of Micron’s GDDR5X memory. The 256-bit memory interface runs at 10Gb/sec., helping to drive 1.7x higher effective memory bandwidth than that delivered by regular GDDR5. Superb Craftsmanship. Increases in bandwidth and power efficiency allow the GTX 1080 to run at clock speeds never before possible — over 1700 MHz — while consuming only 180 watts of power. New asynchronous compute advances improve efficiency and gaming performance. And new GPU Boost 3 technology supports advanced overclocking functionality. Groundbreaking Gaming Technology. 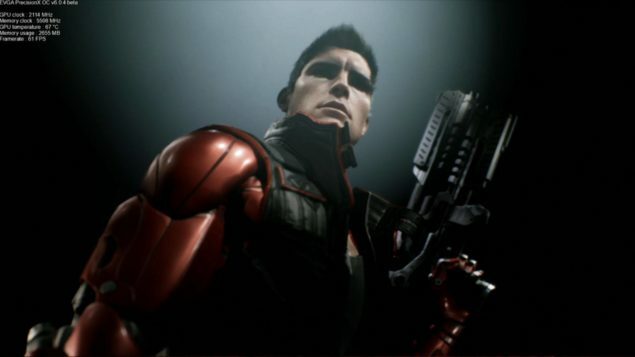 NVIDIA is changing the face of gaming from development to play to sharing. New NVIDIA VRWorks software features let game developers bring unprecedented immersiveness to gaming environments. NVIDIA’s Ansel technology lets gamers share their gaming experiences and explore gaming worlds in new ways. The performance of NVIDIA’s GeForce GTX 1080 is just off the charts. 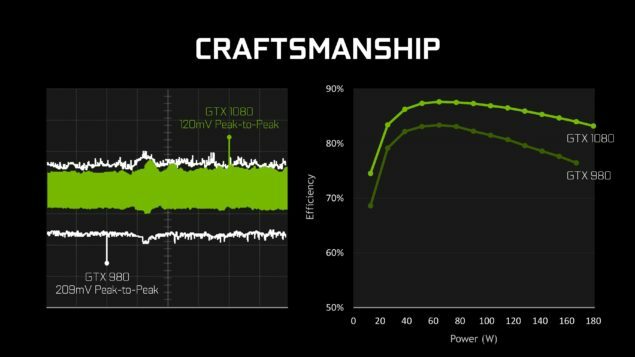 NVIDIA’s CEO, Jen-Hsun, mentioned at the announcement that the GeForce GTX 1080 is not only faster than one GeForce GTX 980 but it crushes two 980s in SLI setup. 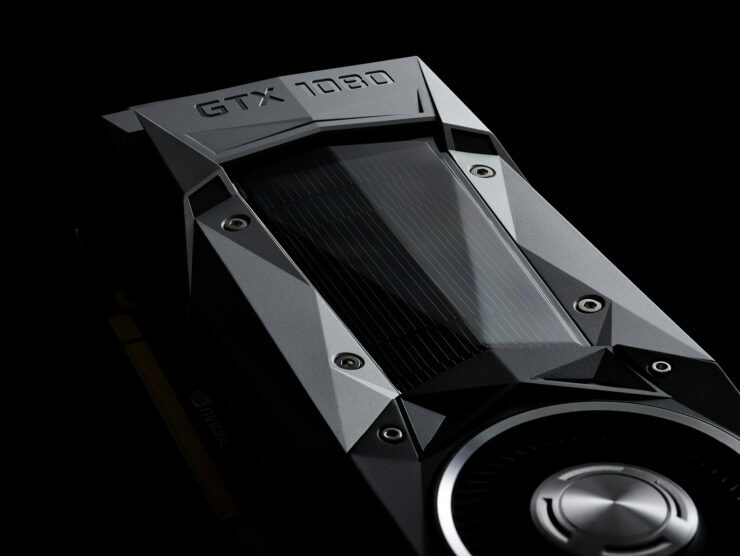 NVIDIA GeForce GTX 1080 Blasts Past The Titan X and Dual 980s in Performance. But that’s just the tip of the ice berg, the performance metrics don’t stop at the 980. Compared to the GeForce GTX Titan X which is a 8 billion transistor behemoth with 3072 CUDA Cores, the NVIDIA GeForce GTX 1080 is a whole lot faster. This means we have a new champ from NVIDIA in the market that beats the GeForce GTX 980 Ti and the GeForce GTX Titan X at just 180W. The NVIDIA GeForce GTX 1080 is officially announced as NVIDIA’s top solution for gamers. Launching at the end of this month, the GeForce GTX 1080 aims to provide the best gaming performance on any GeForce card to date and the surprising thing is that it comes at a price of $599 US. The NVIDIA GeForce GTX 1080 can overclock beyond 2 GHz on air cooling, Enthusiast in for a treat. The NVIDIA GeForce GTX 1080 features the GP104 GPU (GP104-400-A1) core which comprises of 2560 CUDA cores. NVIDIA’s FinFET architecture allows significant increase in clock frequency increase. 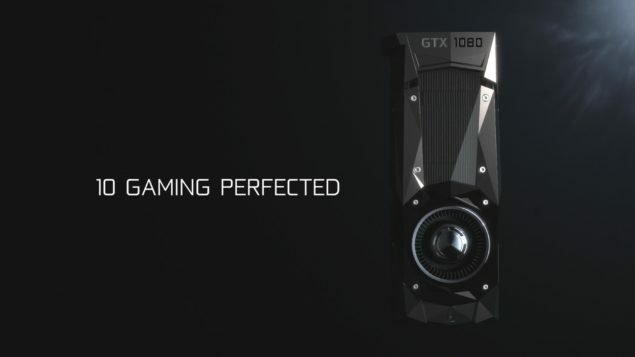 The GeForce GTX 1080 was shown clocking in at 2.1 GHz clock speeds on air cooling. The chip houses 7.2 Billion transistors that close to the 8 Billion transistor GM200 GPU but comes with vastly improved performance, delivering 9 TFLOPs of compute performance. The actual clock speeds are maintained at 1607 MHz base and 1733 MHz boost but the FinFET architecture allows for extreme overclocking as demoed at the event. The chip features 8 GB of GDDR5X (next-gen) memory featured across a 256-bit bus and clocked at 10 GB/s. This leads to a total bandwidth of 320 GB/s. NVIDIA’s latest SLI solution for GTX 1080 provides double the transfer rates! The NVIDIA GeForce GTX 1080 features just 180W TDP. Coupled with a very smooth power delivery system to avoid leakage, the chip is one of the most efficienct GPU architecture ever designed for gamers. The display out puts for the card include Display Port 1.4 (4K @ 120 Hz), HDMI 2.0b (4K @ 60 Hz) and DL-DVI which means that it is capable to support all next-gen displays with new standards. Power is fed through a single 8-Pin connector. For those who like to know what difference is between GDDR5 and GDDR5X, we know from the official specifications published by JEDEC the both memory standards are not a whole lot different from each other but they aren’t the same thing either. The GDDR5X solution is built upon the DNA of GDDR5 and has been updated to deliver twice the data rate. There are a lot of design changes that went in developing GDDR5X to achieve the faster transfer speeds, higher bandwidth and in a package that consumers just around the same power or even lower. Micron states that GDDR5X uses around 70% of the energy that is consumed by GDDR5. The GDDR5X memory supports a 64-bit wide memory access that has double the prefetch against GDDR5 which supports a 32-bit wide memory access. This allows the memory to offer double the bandwidth and at speeds of 1.75 GHz, the GDDR5X memory will achieve data rates of 14 GB/s that will offer bandwidth of 448 GB/s across a 256-bit memory interface. Currently, the fastest GDDR5 solutions like the GTX 980 Ti can achieve a theoretical bandwidth of 336 GB/s while having access to a large 384-bit bus interface clocked at speeds of 1.75 GHz. One of the key changes we note on the GeForce GTX 1080 graphics cards based on the Pascal architecture is that NVIDIA has finally revised and updated their NVTTM cooling solution. Loved by many since the GTX Titan unveiling back in 2013, the NVTTM cooling solution became a hit among the PC Gaming community. The NVIDIA GeForce GTX 1080 graphics card features a neat new design. 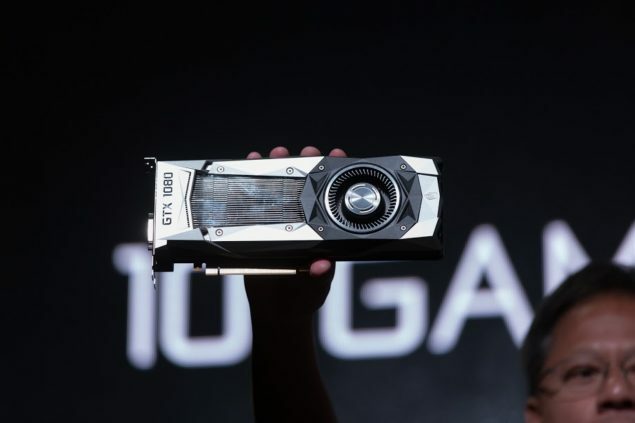 The GPU cooler was also seen as a symbol of NVIDIA’s GeForce GTX products but NVIDIA had been running the same GPU cooler for years. 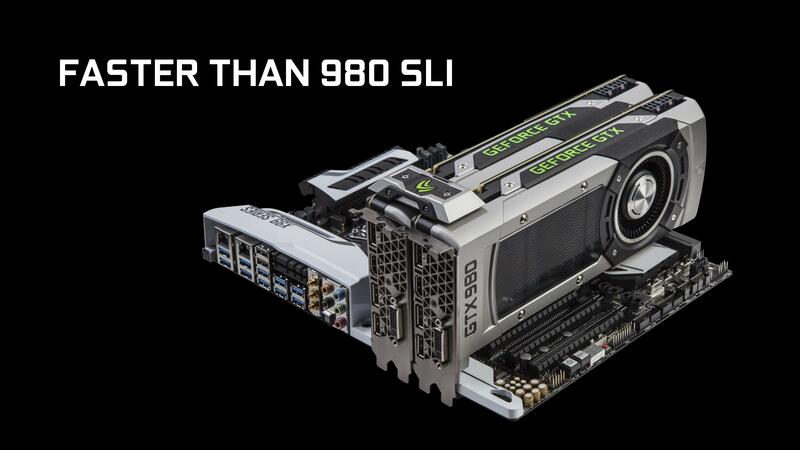 Cards based on Kepler GPUs and even the latest Titan X used a slightly modified version. 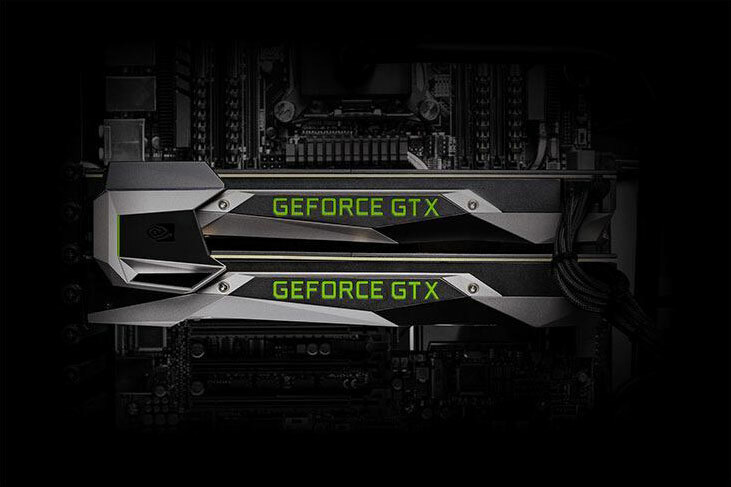 But after two generations of NVIDIA GeForce cards, NVIDIA has finally built the updated version of the NVTTM design that features a bold and aggressive look. Designed with the same magnesium alloy metal used on the original cooler, the GTX 1080 cooler design takes things ahead with better cooling and acoustics. This solution incorporates a new industrial design with advanced vapor chamber cooling that manages temps of 67C in gaming at an insane overclocks of up to 2.1 GHz. To top it all up, NVIDIA also adds a neat backplate to hide the components off from the back of the PCB giving the card a great overall look. The NVIDIA GeForce GTX 1080 launches on 27th May in both reference variants for $599 US and founders edition for $699 US. 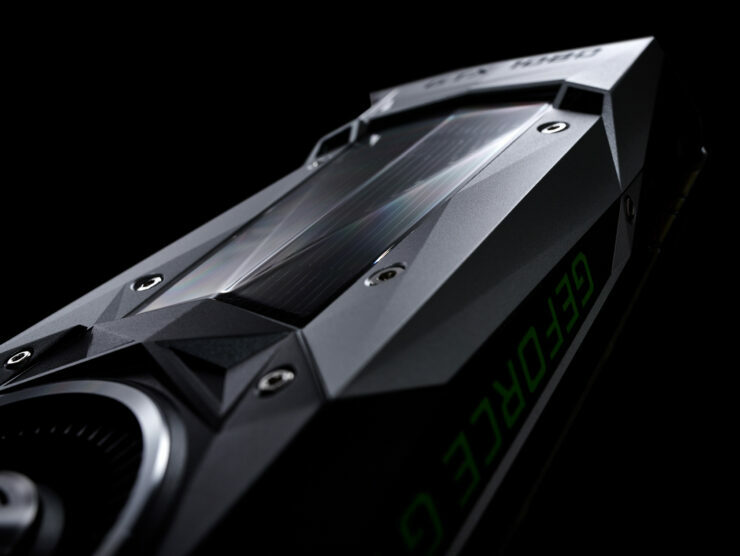 Expect custom models to be unveiled at Computex 2016 from various NVIDIA partners. That’s just about it as far as the Pascal GeForce launch is concerned. 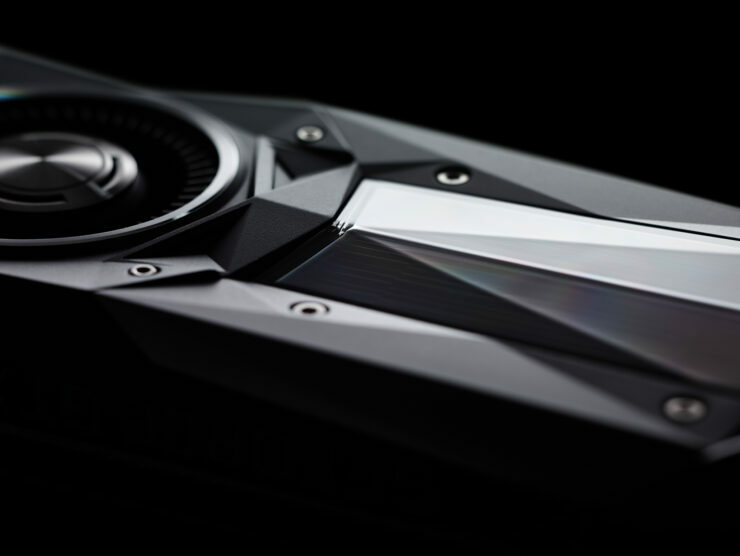 We will be covering the software technologies revealed by NVIDIA shortly so stay tuned and don’t forget to comment what you think about NVIDIA’s latest GeForce cards below!